I was really excited today to go flying. 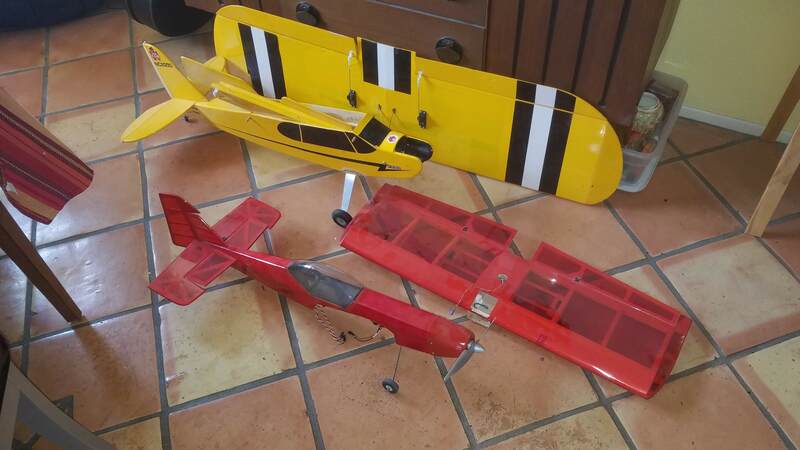 Saturday is obviously our biggest day for our club at our field and i had several new airplanes i had built over the last couple. spent the night last night charging batteries, making sure everything was ready. get up early this morning, load things up, then i get a text. "Hey guys, what time are we meeting @ the north field to do maintenance?" duh, i had completely forgot that everyone was going to help at the other field and would not be flying. i was immediatly bummed and starting trying to think of excuses why i couldn't go, and instead just fly at our usual field. This went on for awhile as i drove out of town, i knew that if i didn't show up it wouldn't be a big deal, i had done several hours of work at our main field just 2 weeks ago but for some reason i just couldn't let go of my guilt. i knew that Rasterize would probably be at the main field wondering where everyone was so i decided to swing by there first and talk to him, let him know what was up, then begrudgingly headed to the north field. i have only ever been to this field 1 time in the past and had never flown there, heck i wasn't even a member since technically it is a diff club. regardless i knew that they would need help. so off i went. when i got there i saw that we 1) had a tractor, which was nice, and 2) the average age of the participants was probably close to 70. there were guys on the field with hoes and rakes clearing weeds. the tractor was digging a hole for the new outhouse, others were helping with the parking lot. i decided my best job would be the wheelbarrow so these "old" guys didn't have to fight with it, and drag it from one end of the field to the other fully loaded. i next went to help with the digging, and help lift and place the railroad ties being used to support the outhouse. next was dragging the field. i got there @ 9am and ended up working until 1:30pm. i haven't done that much manual labor in a long time and my body feels it. now for the karma stuff. i knew i could have easily skipped this event and nothing would have been said but instead decided to help out. while working, a member of the other club arrived with his vehicle full of airplanes and parts. he said he was done with the hobby and it all had to go. 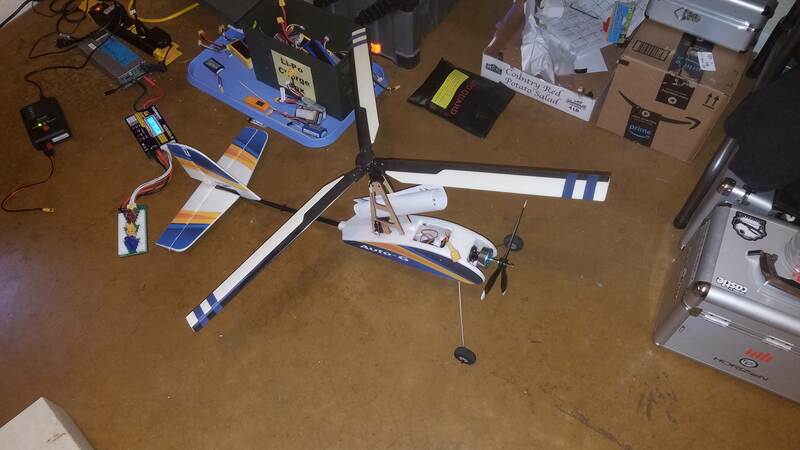 a gyrocopter, with spare motor, props, and rotor blades. i am very excited about this one. everyone says that they are un-flyable but i plan to prove them wrong. heck i built and flew a twin twirl, how hard can it be? 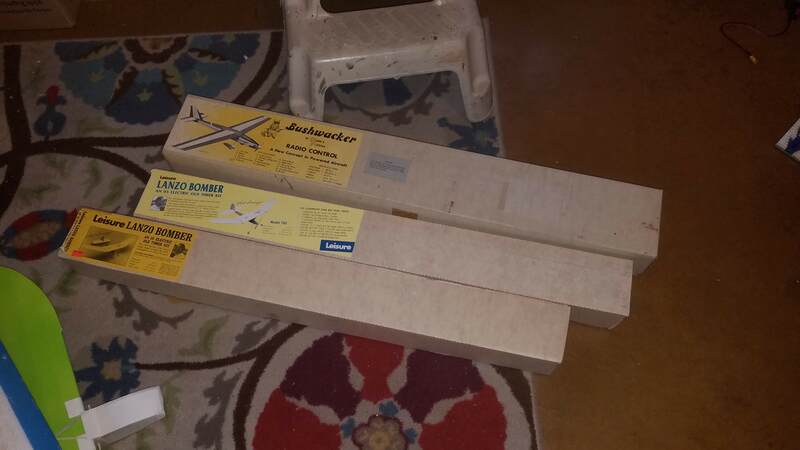 also got an E-flite Radian glider w/ 2 sets of wings. i already have one but i figured i would donate this to my classroom for my students to fly. i have no idea how i got all this into my jeep with all my other planes i had packed for the day but somehow it fit. i get home and start to unload and find a package at my front door. it looks like an amazon box but for the life of me i can't remember ordering anything. so, i finish unloading and then check out the package. it is not from amazon but from forum member FeWolf. i have done several 3D prints for him in the past and in return he had sent me a box of goodies. anyways, moral of the story is no matter what, help when you can. it will always come back to you. i could have just stayed at the field with Rasterize and had a blast flying my new planes but would have missed out on all the goodness. everyone was very appreciative of my help and in return for the effort i was rewarded. i would still have done it, and been happy to do so, but this was a very nice and unexpected thank you. in closing, always remember to be KIND and HELPFUL! not because you are looking for rewards or recognition, but because it is the right thing to do! well i must be doing something right. not sure what it is, but must be something. this followed me home from the field today. another donation. 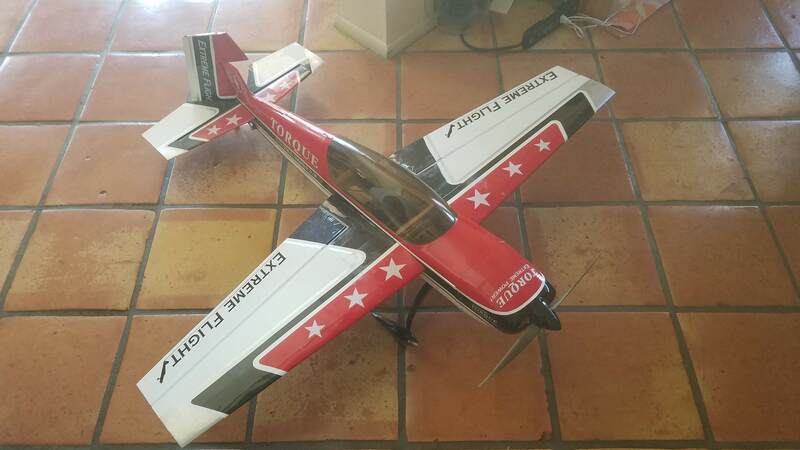 can't wait to try and fly it tomorrow. don't know when i will be able to get to it. it is still in pieces and needs a full assembly. 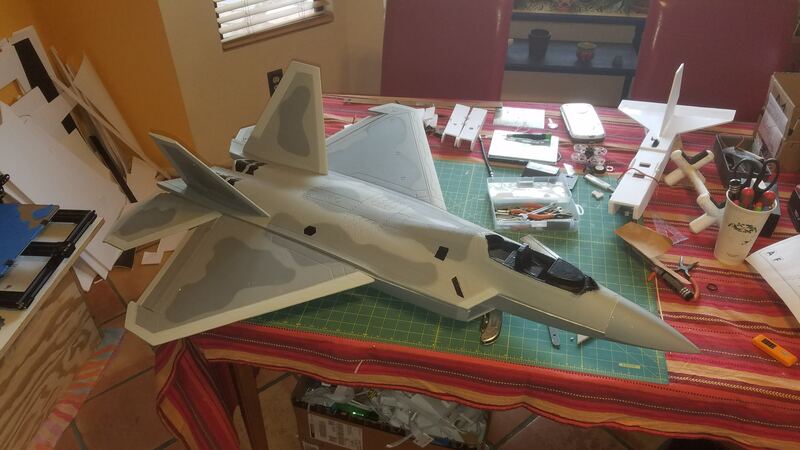 i have 2 current planes about 50% finished, still have Ben's F-16 viper sitting in a box waiting to assemble, an edge 540, a Legacy, and now @Rasterize wants to do a top secret build complete with skins. 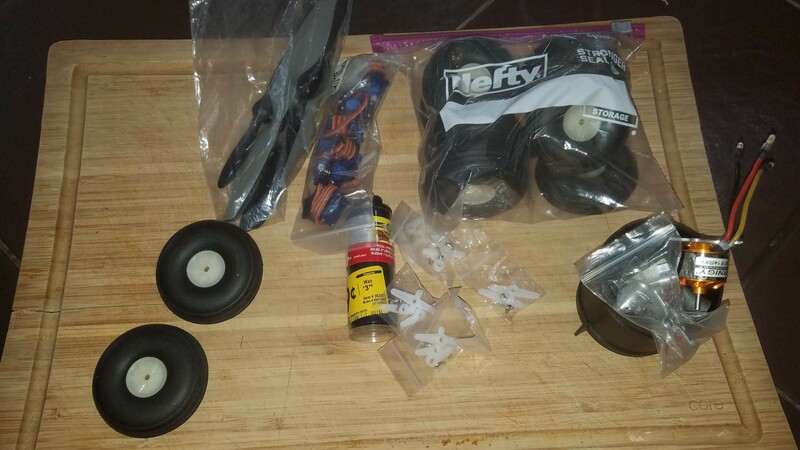 i also just used my last set of counter rotating 2205's for my super bee so i will need to order some before i could even begin. so it may be a bit, but never know this one has me interested. i don't have anything like this in my hangar. Hmm FT thrust vector from their latest vid with twin 2205s on the wings? Just a guess. I love to see good things happen to good people!! flew the extra today for the first time. i had been a little concerned about the CG and did not want to crash this plane so i waited until i knew the guy who gave it to me would be out at the field to make sure i had things right. once sorted, it flew like a dream. 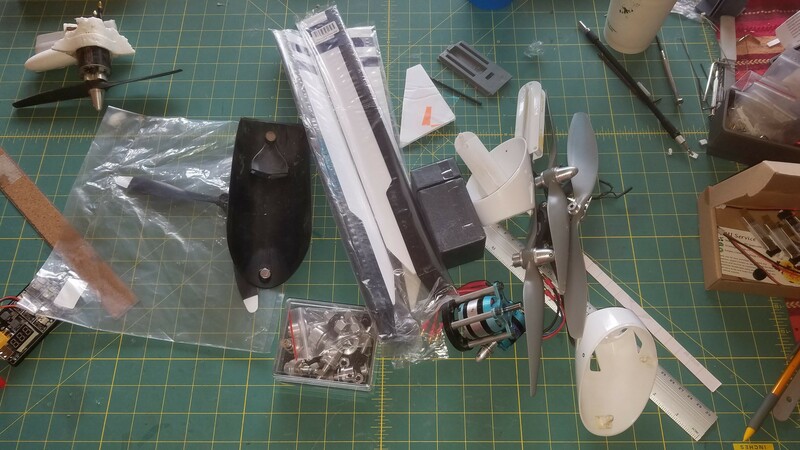 so much more responsive than foam airplanes and more than plenty power. bummer the wind came up and i wasn't able to squeeze in another flight. maybe tomorrow. we did however have time to get Rasterize flying FPV for the first time. first one we buddy boxed but i never touched the sticks, the second i was just spotting and he flew completely independent. he was pretty tickled. we did however have time to get Rasterize flying FPV for the first time.